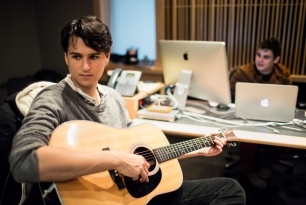 There's a whisper of relief in Ezra Koenig's voice as the singer-guitarist says that Vampire Weekend's third album is almost complete after more than 20 months of writing and recording. "Sometimes we thought maybe we were done," Koenig says. "But it's always very apparent when you're not." Producer and multi-instrumentalist Rostam Batmanglij, the other half of the band's core writing duo, chuckles knowingly. Vampire Weekend – Koenig and Batmanglij, plus drummer Chris Tomson and bassist Chris Baio – have never taken this long to make a record. "There was a certain point where we kind of knew deep down that it didn't quite feel right," says Koenig, who's putting some final mixing touches on the disc (due out in the spring) at Manhattan's Downtown Music Studios with Batmanglij. "We knew it could be better." Last January, they had a breakthrough. The duo holed up in Batmanglij's Brooklyn apartment one day, and in less than six hours they had written "Unbelievers" – a jittery pop tune on par with fan favorites like 2009's "Cousins." That spring, a four-day writing retreat at a friend's house in Martha's Vineyard yielded three more strong new tracks, including the spare, spooky "Hudson." "We tried all different ways of working," says Koenig, "little by little, until we reached a point where we could feel awesome about every song." They headed to L.A. last summer to work with producer Ariel Rechtshaid, a longtime friend whose credits range from the 2006 Plain White T's smash "Hey There Delilah" to tracks he worked on with Diplo for Usher and Snoop Lion. Working with Rechtshaid at a vintage-gear-packed studio built in the 1930s, they turned toward a more organic sound. "The moment we hit a snare drum, we could tell it was the right room," says Rechtshaid. Adds Koenig, "Things that we might have found boring in the past, we've started to find more fresh. This record has more piano and acoustic guitar and organ. But at the same time, that means we needed to find ways to flip it." The rockabilly-styled highlight "Diane Young," for instance, includes a section where Koenig's voice is digitally modulated so he sounds like a pompadoured robot on the fritz. "We've never wanted to be one of those bands that's just reviving something," says Batmanglij. "I think with this album, we've had to be less self-conscious than ever."